Is Feeding Ducks Bread Bad? Learn the Facts! Is Feeding Ducks Bread Bad? Bread and similar products such as crackers, chips, crisps, donuts, crusts, cereal, and popcorn are great sources of carbohydrates but they offer little nutritional value for ducks, geese, swans, and other birds. In fact, bread is the equivalent to junk food for birds. Just like humans would suffer from a diet of nothing but candy, too much bread can lead ducks to excessive weight and malnutrition as well as many other problems. Offered as a rare treat in extreme moderation, bread is not immediately harmful to ducks or birds, but that moderation is hard to judge. While one person or family may only feed the ducks once every few months, there may be many other families and individuals who are feeding the ducks bread far more frequently. Adding all these well-meaning feeders together can lead to a diet based almost solely on unhealthy bread products. Environmentally conscious birders will refrain from offering any bread or bread-like products to ducks to avoid nutritional problems and other issues caused by a carbohydrate-rich diet. Watch Now: What Do Ducks Eat? Duckling Malnutrition: Ducklings require a varied diet and plenty of natural plants and insect proteins to mature properly. 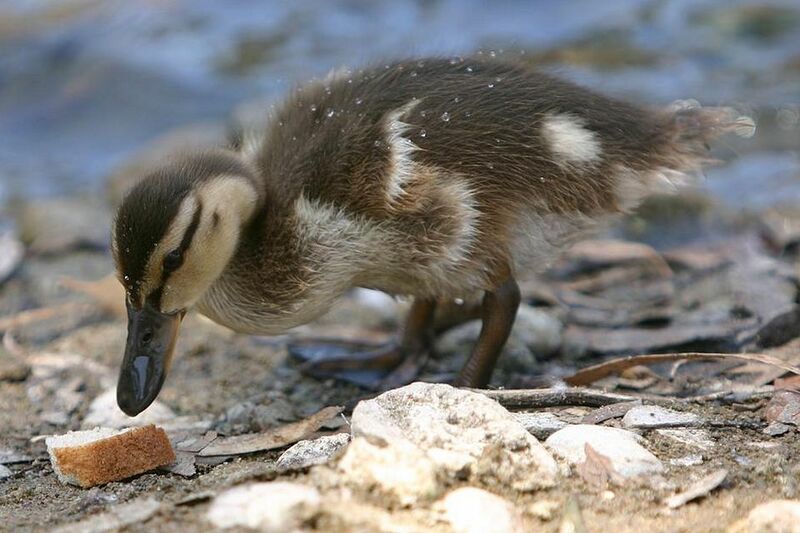 If ducks are regularly fed bread, ducklings will not receive adequate nutrition for proper growth and development. Furthermore, because ducks will eagerly seek out an easy food source such as human handouts, ducklings will not learn to recognize or forage for natural foods as easily. Pollution: When too much bread is offered to ducks, not all of it will be eaten. Soggy, uneaten bread is unsightly and rotting bread can create noxious odors as well as lead to greater algae growth that can clog waterways and crowd out more desirable plants. This concentrates the pollution and can eventually eradicate fish, amphibians, crustaceans, and other life in the vicinity, making good food sources even scarcer. Diseases: Feeding ducks bread can increase the spread of diseases in two ways. First, a carbohydrate-rich diet leads to greater defecation, and bird feces easily harbor bacteria responsible for numerous diseases, including avian botulism. Second, moldy bread can cause aspergillosis, a fatal lung infection that can decimate entire duck and waterfowl flocks. Pest Attraction: Rotting food leftover from sated ducks will attract other unwelcome pests such as raccoons, rats, mice, and insects. These pests can also harbor additional diseases that can be dangerous to humans and threatening to other wildlife. Of course, the best way to use up stale bread without feeding it to ducks is to avoid having any leftover bread in the first place. Bread can be easily frozen until needed, or birders can monitor their menus and shopping to ensure there are no leftovers that would be tempting to feed to ducks. Can Any Bread Be Good for Birds?